Magnus Engineering & Maintenance Ltd.
Magnus, is a privately owned company established in 1991. The owners carry the key positions in the company. Magnus employs 50 people, over half of whom are engineers whose fields of specialization cover the entire spectrum. Incorporating under one roof all of the skills involved in design, engineering, software development, production and logistics, Magnus offers fully integrated capabilities in the fields of mechanical, electronic and software engineering as well as project management and maintenance. Magnus can deliver a total turnkey package, taking responsibility for every stage from initial planning through hands-on training, and also undertakes projects that are more limited in scope. From computerized upgrades for existing facilities and conversions for alternative or additional engines to open facilities, hushed facilities and demountable-transportable facilities, Magnus integrates innovative engineering with high tech equipment in order to provide a variety of flexible solutions. 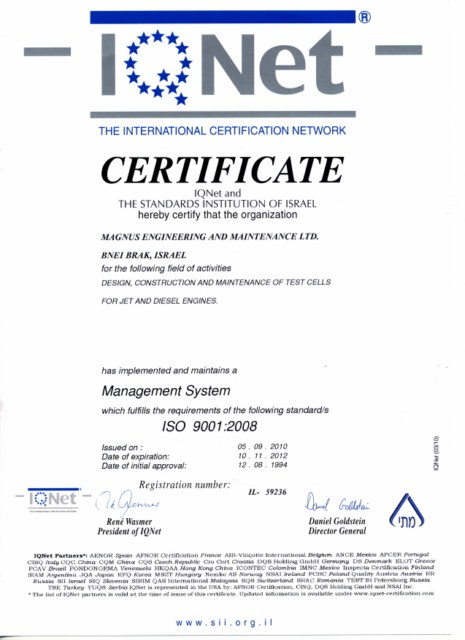 Magnus is an ISO 9001:2008 Quality Assured Firm, authorized by the Standards Institution of Israel and IQnet. Magnus engineering and consulting services specialize where technical challenges require creative, cost effective high level engineering design solutions tailored to the customer needs. 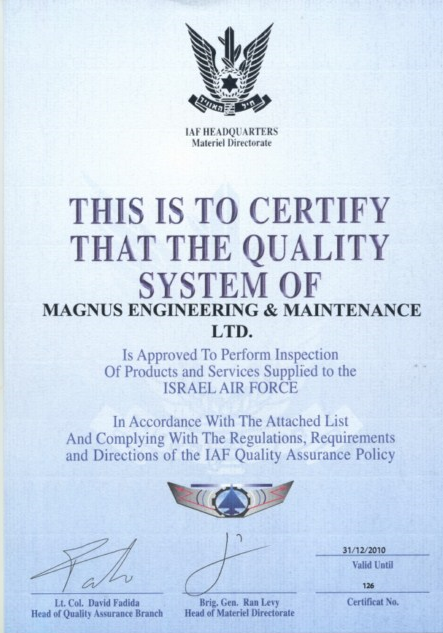 Magnus manufacturing and maintenance plant is located in Yavneh Industrial Park Zone. The plant provides wide range of services for advanced test equipment from ground support equipment up to aviation applications. 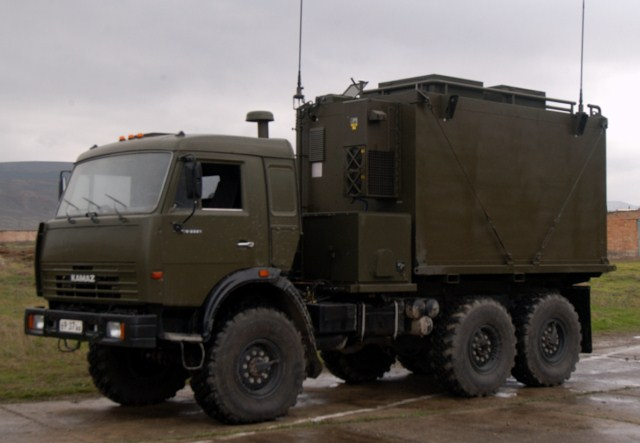 For more than a decade Magnus manufacturing and maintenance plant provided comprehensive mechanical and electrical equipment solutions for civil military industries both in the international and domestic marketplace. The plant is staffed with a team of professionals and qualified field engineers, highly trained experts, which can provide complete comprehensive solutions for customers' requirements. The field engineers have a full backup from engineering departments of the company. • Manufacturing and maintenance of a wide range of testing equipment. • Manufacturing and maintenance of special tools and equipment for maintenance operations. • Manufacturing and maintenance of electrical equipment. • Maintenance of various testing equipment. The test equipment manufactured by Magnus provides a full range of testing solutions, from a simple GO/ON GO indication up to comprehensive and advanced tests, tailored for each customer's requirement. 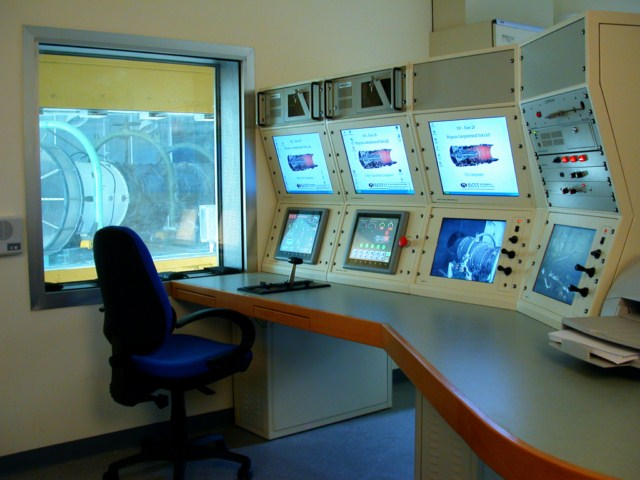 The equipment manufactured by Magnus is provided with an integrated documentation, engineering data and in-depth training. 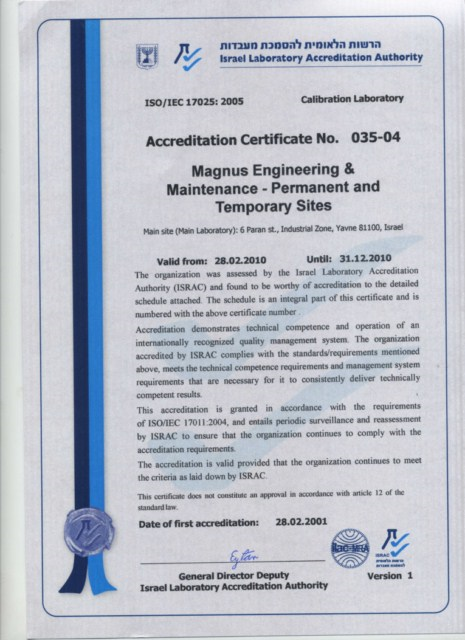 Magnus Calibration Laboratory is accredited by ISRAC (Israel Laboratory Accreditation Authority) provides a wide spectrum of calibration services for wide range of domestic Israeli sectors. The calibration services of Magnus are offered as a comprehensive solution which covers a wide range of customers measuring equipment according to ISO/IEC 17025. Magnus provides fluid flow calibration services since 2001 and is a pioneer in this field in Israel. 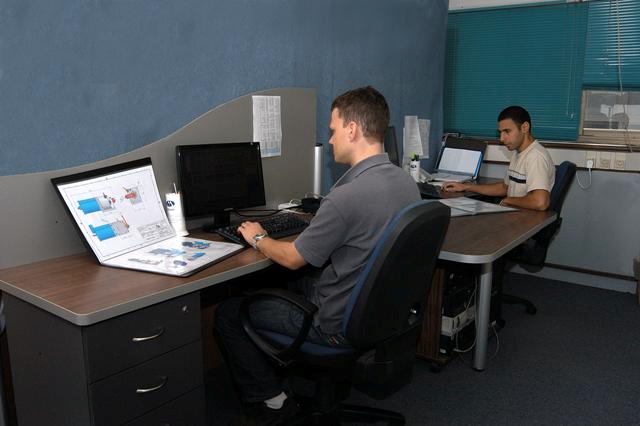 Calibration services can be provided inhouse or at customer site. Magnus Engineering offers a complete range of management services to support customers maintain competitive edge in their respective markets and to have the most economical project solution. 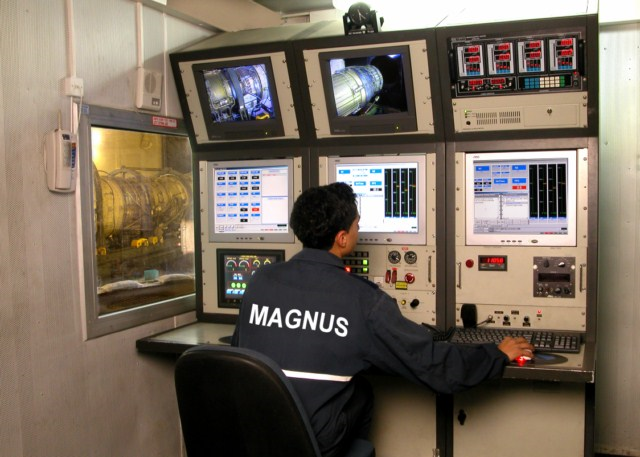 Magnus provides a wide range of solutions for Engine Test Facilities – starting from design of various systems and up to design and built turn-key based custom test facilities. On turn key test facilities Magnus brings an interdisciplinary approach that combines the talents of software, electronic, mechanical engineering and experience of 20 years. At all turn key projects the company's services include, program management, design, implementation, training, documentation, warranty and long term customer support. Design disciplines cover site development, foundations, civil engineering works, acoustic treatment, fuel farms and fuel supply systems, electrical system, fire detection and extinguishing systems, compressed air and starter air systems, PLC based engine / facility control and monitoring systems, computerized data acquisition systems, software, dynamometers selection, dynamometer water cooling systems, test stands etc. Implementation covers all the above subsystems and as mentioned above Magnus provides customers long term technical support. Magnus specializes in the upgrading of existing test cells / facilities. The company offers the most advanced technologies taking into account the customer's requirements and the budget. The solutions offered for upgrading the existing systems aim at getting the most cost effective upgrade possible in short schedule. Magnus has the capability to upgrade all the existing subsystems in the existing test cells / facilities. Particularly the upgrading of the existing control and data acquisition systems to specially developed for engines test cells, PLC based engine / facility control system and sophisticated real-time data acquisition and processing system. 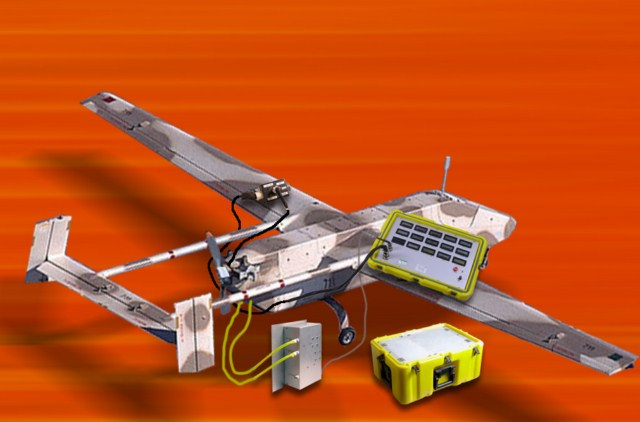 The MDRU II is a hand held computer system designed for retrieval, analysis and display of data acquired by the airborne Engine Monitoring System (EMS) installed in modern jet engines such as F100-PW-220/229, F110-GE-110 and T700-GE-701C. The MDRU II is a generic and versatile device, readily adaptable to handle any modern jet engine. Engine “Go / NoGo” indication for aircraft mechanics on the flight line. In-depth data analysis tool for engine specialists. Increased fleet readiness by reduced turn around time required for EMS data reduction. Real-time monitoring/recording of engine data during ground runs. Flexible communication options to a host computer: RS232, dial-up modem, USB, Ethernet. 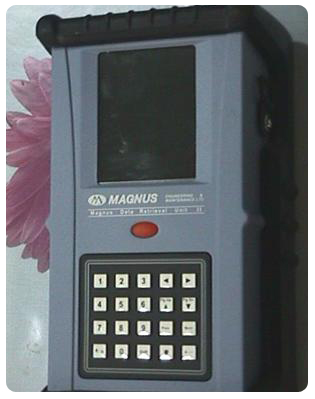 Magnus Computerized Test Cell (MCTC-2001) is a powerful generic software package that provides all the data acquisition and data processing functionality required for the operation of automated engine test cells. For some engine types, the generic software package is complemented with engine specific software code. The user interface with MCTC-2001 may also be customized to meet specific test cell needs. Magnus A/M37T Engine Test Stand Upgrade Kit is one of the ideal solutions for the test stand users to upgrade and modernize the test stands model A/M37T-20A, 20B, 20C. The Magnus upgrade kit will extend the life of the test stand and will allow users to run engines with advances and computerized systems. Fuel Trailer upgrade, installation of a new electronic fuel level transmitter for continuous fuel level measurement of the fuel in the tank , and replacement of the existing flow meter with 2 inch Corriolis mass flow meter. Control Trailer upgrade, replacement of the existing control consol with a new configuration adapted to the new hardware. Data Acquisition and Control System, replacement of the existing throttle system with a new electronic throttle system, replacement of the existing instrumentation and controls with a new advanced electronic instrumentation and PLC based control system, installation of a new computerized data acquisition system and software. Magnus Shelter is a mobile tactical shelter designed for transport by track. The Shelter is lightweight, high strength, insulated in all weather. The Shelter provides a mobile, environmentally controlled working, living and storage space. The Shelter consists of six panels, four side panels, roof and floor. The panels are of a sandwich type construction, 5 cm. thick with closed cell self extinguishing hard foam core and reinforcing members between aluminum alloy skins. The panels contain structural aluminum members to which equipment can be mounted either inside and outside of the Shelter. The 182 cm. by 83 cm. door at one end of the shelter comes with a 49 cm. by 49 cm. quick release vent and escape panel built into the door. A perfect seal has been achieved by using special glues during Shelter construction. The shelter is completely water tighted. Roof load – Snow and Ice load of 366 kg/m². Lifting eyes, one at each corner. Towing eyes, four, two each side. Heat transfer coefficient – U Factor - 1.7 W/°C/m²/hr. The Shelter can withstand exposure to an atmosphere with 100% humidity. Custom sized, adapted to the truck model. Antenna masts (Electrical, Pneumatic, Manual). The Shelter can be provided with external power supply assembly which includes. Diesel Generator 220VAC and 24 VDC Batteries. Complete Electrical System including lighting, regular and camouflage blue. The light is automatically switched from regular to camouflage when door is opened. Integration of customer supplied systems. External and internal Storage Boxes. Cable Entry Door & Hood. Magnus Airborne Engine Containers designed to support storage and preservation and transportation of bare engines at rough handling and severe / extreme environmental conditions. Easy and safe installation of the engine in the container. Safe transportation of the engine. Easy inspection procedure during engine preservation. Measurement and display of preservation parameters. Maximum internal working pressure: 28 psig (25 psig nominal + 3psig altitude). Maximum hydrostatic test pressure: 42 psig. Altitude and temperature: Up to 5000 feet (-) 20°C to (+) 55° C.
Non operating temperature: (-) 40°C to (+) 71°C. Transportation, Vibration and Shocks:Transportation and Vibration per MIL-STD-810F Method 514.5 category 4, shocks per MIL-STD-810F Method516.6 procedure IV. Stack height: With engine - 2 Maximum. Without engine - 4 Maximum. 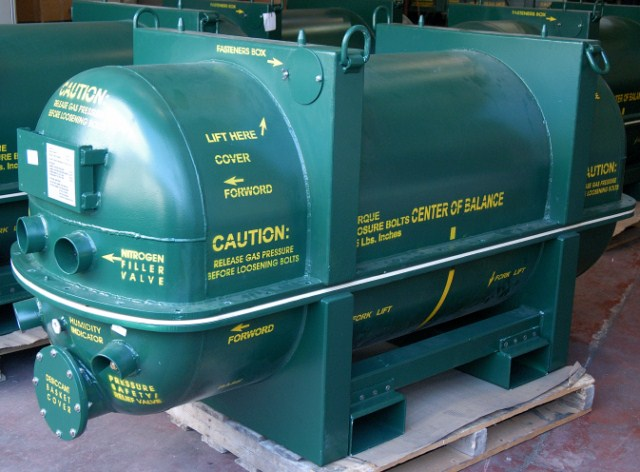 The containers are designed to be handled with either a forklift and over head crane system. The project is Turn-Key project for design, development, construction, manufacturing, installation, calibration and acceptance tests of hardware and software of T64/T700 Engines Test Cell. Upgrade of the Engine / Facility Control and Monitoring System, supply and installation of new Computerized Data Acquisition System for CFM56-2/3/5/7 series engines. 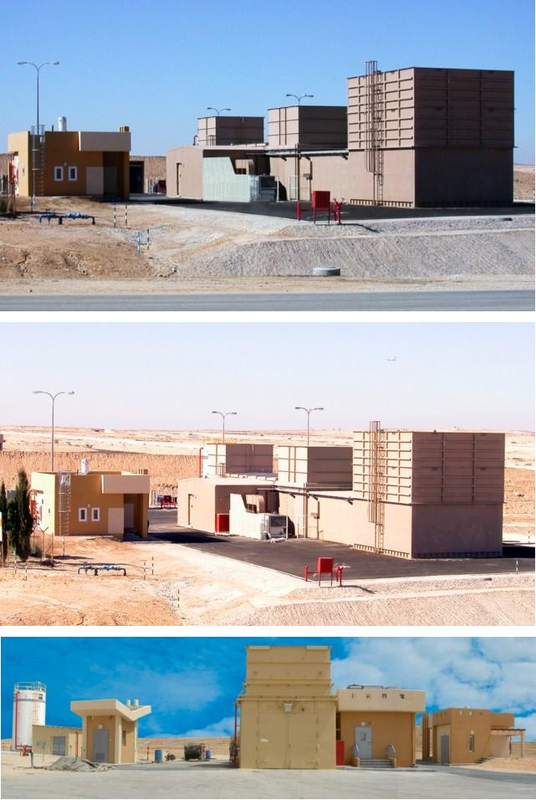 The project is Turn-Key project for development, design, manufacturing, installation, integration and acceptance Tests of tactical Mobile Command Shelters. Complete Electrical System including lighting system day and night. In addition to the above, the project included development, design, manufacturing and installation of special fixtures for safely installation of the shelter on the truck. The project was Turn-Key project for development, design, manufacturing, and acceptance tests of PT6 Engines Storage & Preservation Containers.